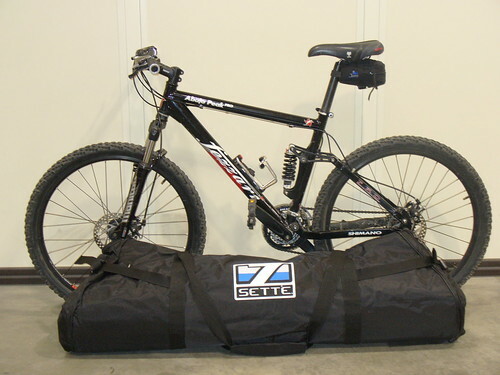 Product Tested: Sette Padded Bike Travel Bag with Wheels. My background: I am 5’2″ 165lbs. I am a bicycle commuter that travels about 8 miles round trip. I’m a weekend mountain biker always looking for a new trail. Testing Grounds: New Cumberland, Pennsylvania. First Impressions and Comments: The first thing that I thought of when I saw this bag was the dimensions. It is a big bag, very impressive. After further inspection I noticed the wheels, good thing for I don’t have to carry it on my shoulder when I travel. The wheels are just like roller blade wheels, very smooth and can spin forever. They are re-enforced by a hard plastic bottom for support. The fabric and padding are made with high quality materials. 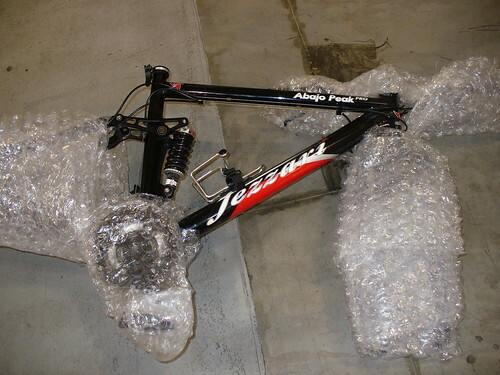 However, I would pad the dropouts, fork, derailleur and chain rings for added protection. I would also recommend that you remove the quick release skewers and place them in the accessory bag to prevent them from penetrating thru the bag. Strengths: The padding is nice and thick. If you wanted to put a person in there and roll them down the a hill, they would be nice and comfortable and not experiencing any irriation from the outside worlds. 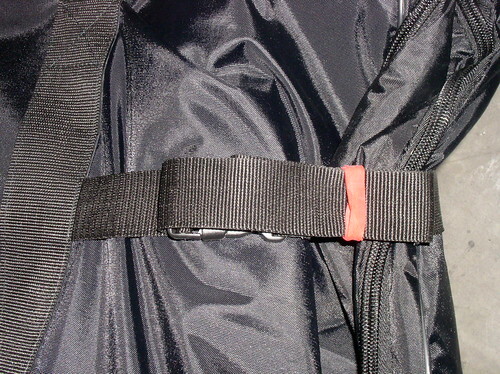 The quick release straps on the outside are a good re-enforcement for the zipper it takes pressure away from it. 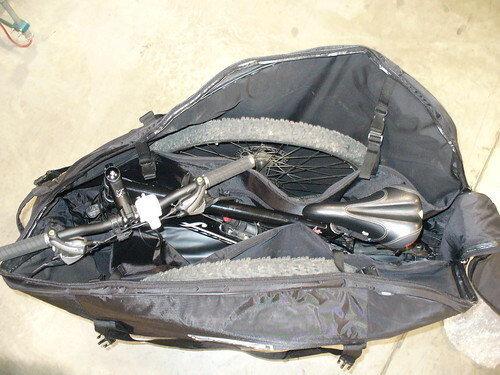 The inside has two nicely padded pockets for the wheels,which would separate the wheels from the frame. It also has two small compartments with a zipper for small articles such as the skewers, wallet, keys and etc. 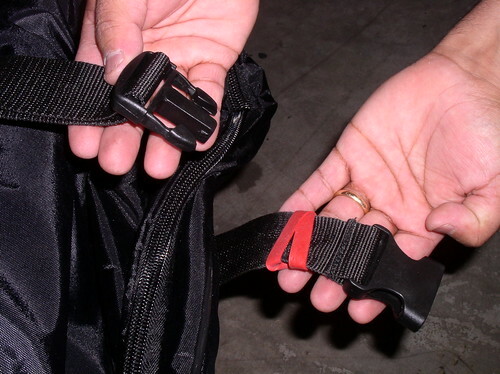 Weaknesses: On the quick release straps there should be a slack retainer for the excess strap rollback. But you can always put a rubber band or tape it so it is not flapping during transportation. Loose slack on one quick release and the slack rolled under the rubber band on the other quick release. Would I recommend it? 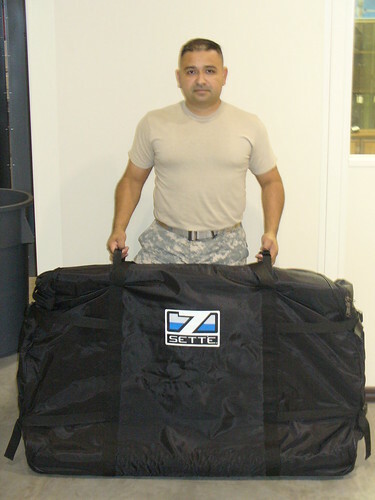 You will not find a bag of this quality and durability for this price anywhere! I would definitely recommend this one to anyone. 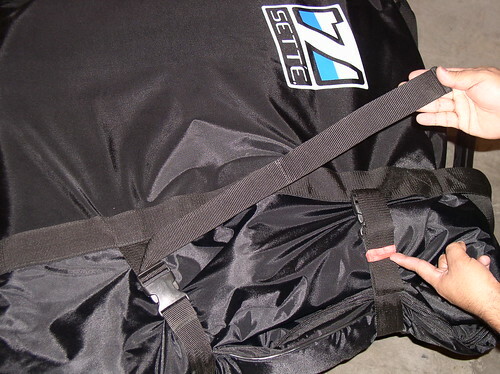 Whether you’re riding a beater bike or a high end bike and you want to protect your investment, the Sette Padded Bike Travel Bag is for you. There’s no way you can beat the price of this bag. My recommendation: Personally, I would add some padding on certain areas of my bike. It will not only add some more protection but it will keep my bag intact from grease for example. 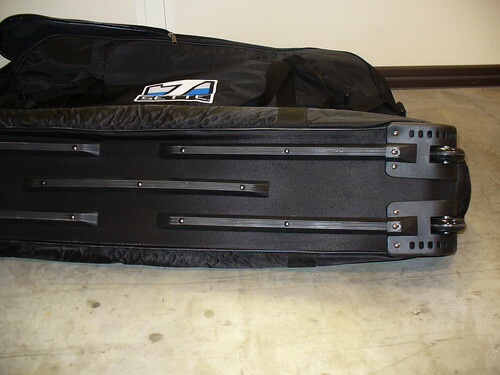 Fezzari Abajo Peak ready for traveling. The smallest this bag gets is the way you see it in front of the bike. If you travel a lot, this bag has plenty of room for gear or clothes. Once you get to your destination it would have to be stored in a car, under the bed or closet. The bag doesn’t fold too much. The bag part can be rolled up, but its the bottom where the wheels are that can’t be folded due to it hard plastic bottom. Looks like this bag would be great for the upcoming holiday traveling season. In the first pic it shows several creases that look like the bag was either rolled up or folded up is that correct or am i just fantasizing? Would it fit a bigger downhill/freeride bike? This is a fairly large bag. I fit my 58cm road bike (large) in it without even lowering the seat, of course removing the wheels. I removed the handle bars and pedals but I think I could of left the pedals on and just turned the fork for the handlebars. 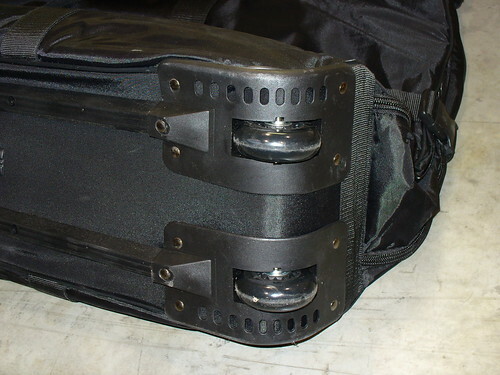 One advantage of this case is because of the 4 external belts the bike can be made smaller by tightening them. Overall a pretty good bag. 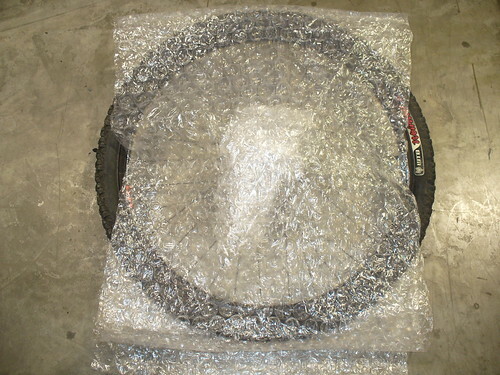 I would recommend however if using for air travel you would put some thick cardboard on either side and put a good amount of protection for the frame. do you have to take off both wheels for it to fit in the bag? I have a Trek 830-will it fit if I just take off the front wheel? Did the airline charge you for your bike and did you an other luggage checked in??? hey, are there smaller bags? and did you get charged for having oversized luggage?